Donncha graduated from NUI Galway with a Masters in Marketing. He worked at Ibec’s Mid West regional office before moving to Limerick Institute of Technology, where he worked as Campus Incubation Centre Manager for four years. During his time at LIT, Donncha achieved 100% occupancy rates for the centre; with three of the companies securing HPSU (High Potential Startup) status with Enterprise Ireland. A native of Tipperary, Donncha lives in Galway but works with startups and startup programmes across Ireland. It was his experience with startups that led Donncha to get involved with the New Frontiers Programme, from its inception in 2012. He offers one-to-one mentoring and leads workshops for both Phase 1 and Phase 2, in areas such as lean startup, sales, marketing, business plans, business models, market validation and financial projections. He works with the Institutes of Technology of Letterkenny, Sligo, Tralee and Galway-Mayo and is a member of the six-person team of specialist trainers delivering the Phase 2 training programme at Dundalk Institute of Technology. On top of that, Donncha is also a member of the Enterprise Ireland Mentor Network and was a member of the External Evaluation Panel for Enterprise Ireland’s Competitive Startup Fund, from 2012 to 2014. He is a non-executive director of a technology startup. Donncha particularly appreciates how the New Frontiers Programme gives trainers the opportunity to get to know participants really well, helping them to achieve the best results possible. One recent success story that Donncha was involved in is that of Theresa Mulvihill, from Tamm Technologies. She secured Competitive Start Funding after participating on New Frontiers in Limerick and her SaaS marketing resource management system is gaining traction in its target market. 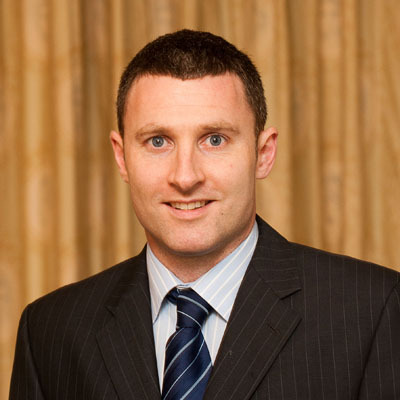 Donncha has also worked closely for several years with Anne Walsh, of Allergy Lifestyle based in Castlebar, Co. Mayo. In 2013, Anne attended a pre New Frontiers programme delivered by Donncha on behalf of GMIT. A year later, she was offered a place on GMIT’s New Frontiers programme. In 2015, she secured CSF funding of €50,000 from Enterprise Ireland. In 2016, her business, which has developed a medical case for storing allergy medicines, secured €70,000 from Barry O’Sullivan on Dragons Den. Allergy Lifestyle is now seeking HPSU investment to support plans for international expansion. Donncha also finds time to curate Startup Digest Galway – a bi-weekly digest of startup-related events in the area.